Designing classes for a certain lifestyle, specific health issue, aches, or pains, Kaitlin enjoys creating an open space for practice not competition. 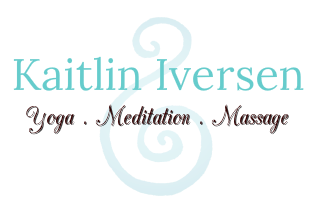 No matter your level, Kaitlin allows people to detach from their everyday stresses and routine; to open the communication between the mental mind and the physical body using breath and awareness. Certified in Pre and Postnatal Yoga, Kaitlin also holds an interest in restoritive women's health. Hatha Yoga is the most widely practiced form of yoga in the world. Hatha Yoga uses postures (asana) and conscious breathing (Pranayama) in combination with mental focus to develop awareness, strength, flexibility, and relaxation. Through proper alignment and mindful actions of the body, Hatha Yoga brings balance, strength, and a sense of well-being to the practitioner. "Yoga teaches us to cure what need not be endured, and endure what cannot be cured."